A few weeks ago I started a new series called Residential Architecture 101 and the first item we reviewed was material transitions in exterior applications, and yes, it was mind-blowing!! 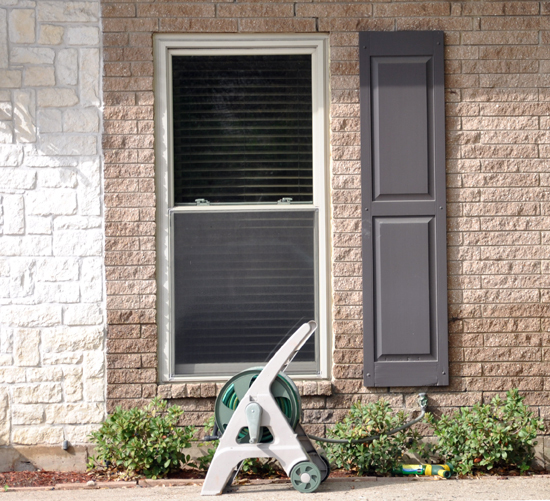 (read it here) Today, however, I would like to take a look at exterior shutters, which are very common and frequently the target of DIY’ers and weekend warriors. Technically a shutter is either a solid or slanted window cover. It is believed that the first shutters originated from Greece and that they were originally designed for light control, ventilation and protection from the elements in a tropical environment. Pretty standard stuff really and I think we are all familiar with how they look but I don’t think people are familiar with how they work. I say this because most current shutters don’t perform any of these tasks – they don’t even to pretend to do any of those things. 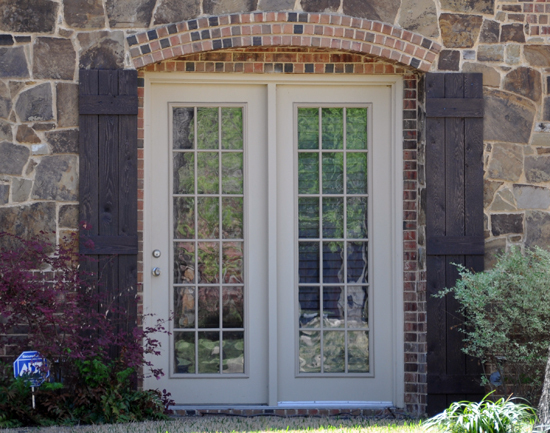 One of the very basic premises that all shutters should have is that they look like they could actually protect your windows. That means that if they could be closed, they would cover the window. Many houses are designed with windows that were never intended to have shutters but people will stick them on there anyway. Neoclassical style house – a fine example with the windows on the 2nd level adorned with shutters that are both operable, appropriately sized. I have enlarged an image of the shutter to the right. Tudor style house – in this example, the shutters are solid but still sized so the shutter could cover the window when closed. 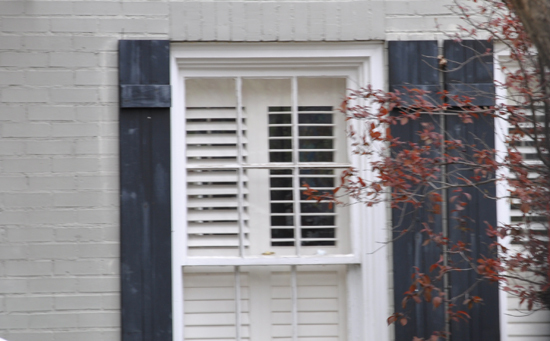 I appreciated the fact that this style of shutter seemed a better fit than a louvered style. Italian Renaissance-style residence – in the enlarged portion I can’t find any real evidence that these shutters actually close but the fact that they sized to fit above the window sill and below the cornice trim – along with the catch to the side – give the appearance that they could close. Good enough for me. 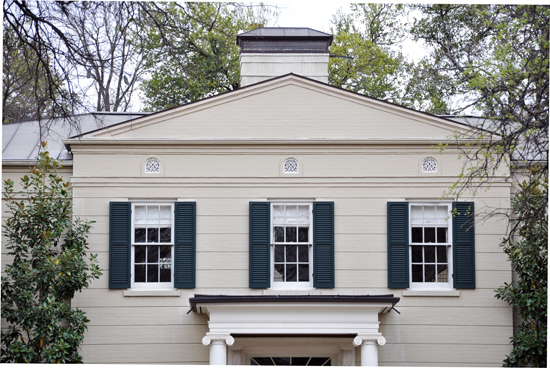 Greek Revival style house – just one more example of shutters that are appropriately sized and operable. What!? Is that??! Why is it so far…??!?! What is going on in this picture flies in the face of all that is decent while breaking all sorts of common sense rules – including material transitions that we covered earlier. All that really needs to be said is – that’s nasty. This is a terrible photo (collected under cover as I was driving by at 20 MPH). This is a good-looking house with some crazy sized shudders. Looks like they were sized to allow two to fit between the adjacent windows … yikes! This photo was sent in by loyal reader Preston who took this with his camera phone while walking his dog. Yes, you are seeing shudders on a bay window. rtjdhruhhkjva-08yah akl;oah;o … sorry, my head just hit my keyboard. This picture make my face hurt – but in an entirely different manner than some of the others. 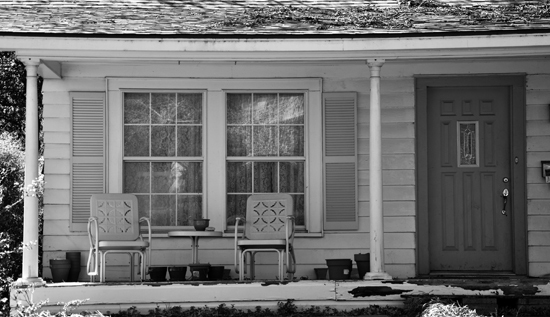 Despite the half-moon window (almost always a no-no) the shudders on the window on the left are actually sized properly and could actually function as real shutters. They even cut into the stucco feature above the window to allow these shutters to close. So what happen to the shudder on right? Since there isn’t any hardware shown attached to the wall (that should be visible when the shudders are closed) I am feeling confident in saying these are impostors. I don’t always hate fake but let’s see some consistency. Here is an example of shudders to either side of a recessed set of doors. I assume they are supposed to be shudders although it really looks like pieces of fencing leaned up against the house. It was quite unnecessary for these to be added and I would argue that things would have been better if they had simply been left off the building. What I hope you have learned from this post is that shutters weren’t always about adornment and decoration – that they served a purpose. It is that purpose that should guide you when deciding to add shutters to your own home so that they look like they are supposed to be there. Sizing them correctly so that they look like they could actually do the job is all I am asking for – it’s not so much to ask, is it? Yes, this does mean that those plastic beauties on aisle 12 of your local BuyMore big box home improvement center should stay on aisle 12. Filed Under: Materials and Products, Observations Tagged With: Materials, Products, what?